As a Battle Wizard trapped in the endless trenches of unbridled, masochistic depravity - A.K.A. Rumble at Castle Tentakill - your sole purpose is to taste the sweet blood nectar of your foe. Still thirsty? Invite more foes. Victoriously reign over the 2-6 Wizard battlefield while using all the powers and debaucheries available to your mojo fingers. A deceivingly simple (up to) 3 card spell lures your one-time "friend" in and then spits out a smouldering mound of what looks like brown pudding covered with hair. 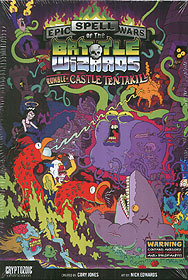 To topple Castle Tentakill you will summon forth Wealthy Brain-Eating Squirrels, Muscle-Bound Land Sharks, Sexsquatches, Jelly-Squares, Carnivorous Clowns, Fart Knights, Pimped Imps, and many many other absurd adjective and noun combinations. That's how twisted this battle is - conventional grammar no longer applies. IT'S ANARCHY! Do you have the testicular fortitude to end this Epic War? Have the 20 exclamation points on the box pushed your excitement button? Let's DO THIS!!!!!!!!!!!!! Stand-alone game AND 100% compatible with the original game! 8 New Wizards to duke it out with! Adds mythical CREATURES, rivers of BLOOD and battle-altering REACTIONS! New "Quick-Match" mode for a faster way to beat down fools!